Women in Leadership Change Management, Diversity, Women in Leadership Start a discussion! Today, we still witness gender inequality in the workplace. Especially at executive level, women usually tend to be underrepresented. 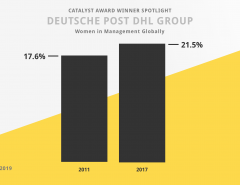 As a senior leader in Deutsche Post DHL, I am personally dedicated to get more women into leadership positions and promote diversity. DPDHL hosted a conference on the topic, and I was there to exchange experiences with other female leaders. Here is my recap of the event’s key takeaways. Thomas Ogilvie, HR Board Member at DPDHL Group, opened the conference. He emphasized that, as a company, we are convinced that diverse teams are better equipped to manage the digital transformation the Group is facing today. We are therefore committed to diversity. There are two key messages that I took from his opening key note: First off, we should welcome change and uncertainty. Also: through adaptability, we can take ownership of change processes. 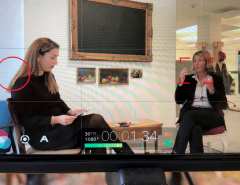 Two female leaders – in my opinion true role models – Béatrice Guillaume-Grabisch (CEO Nestlé Deutschland AG) and Adrienne Axler (CEO Sodexo Germany) held captivating presentations. They shared their leadership journey with us and gave tips on achieving leadership success in a global environment. The four key messages I took away from their talks are: 1) be clear about your ambitions and make these heard, 2) get involved in networks and boards, 3) be authentic, and 4) more freedom goes hand in hand with more responsibility. How can we unleash our full potential? Based on the experiences I made during my own career, I believe there are a few factors that facilitate women’s career advancement. Understanding these can help business leaders to more effectively pursue their gender diversity strategy. I have stressed the importance of a conducive corporate culture to foster diversity in my previous publications. A company culture needs to embrace diversity and be rooted in inclusion, openness, and an appreciation of people’s unique qualities. We as leaders need to prioritize this cultural pillow and continuously foster the supporting habits, processes, and values. I especially call upon all female leaders to be diversity advocates in their organizations and promote a conducive culture. In my opinion, women need to be powerful agents in driving their own professional development. Women should dream big and be ambitious – don’t hold yourself back! More than functional expertise and training, soft skills, such as empathy, risk management, and adaptability in times of change, will be determinant for your leadership success in the era of digital transformation. There are several factors that act as enablers for women’s career advancement. In other words, they can, in addition to the corporate culture and the individual, affect the likeliness of women moving into higher-level positions. First off, the availability of female role models can function as an enabler. 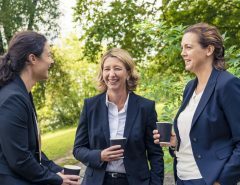 Female leaders can inspire other women to work towards executive roles themselves. I would like to encourage women in executive positions to proactively and visibly act as role models for other women. Having more role models will lead to a multiplier effect of more women entering management positions. Other enablers are digital tools. Thanks to these, key career drivers such as networking, visibility, and flexible working models can take on new shape. The digital era brings about various benefits, which – when leveraged effectively – can help get more women into leadership positions. Because of this, I believe, it is paramount for women to acquire digital skills which they can use to gain more visibility, cultivate relevant relationships, and raise their voices. Digitalization also drives the shift we are witnessing from largely hierarchical structures towards more networked structures. Hierarchical structures can work as an impediment to women’s career advancement, as they can limit inclusion, transparency, and opportunities for development. 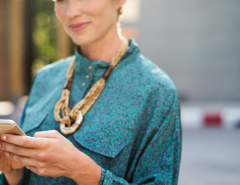 In networked structures, these downfalls can be reduced, giving women more access to relevant information and connections, including mentors or sponsors – which are all critical factors for career growth. The individual, the cultural setting, and the enablers build on each other and result in a framework that can help understand how women’s career progression works and can be promoted. 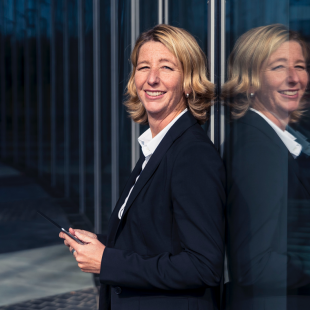 Establishing gender balance in the corporate world still requires hard work from all of us. Deepening our understanding of the roots of the persistent underrepresentation of women in management is the only way to make actual progress. Business leaders are crucial change agents in this. At an individual level, I believe women can utilize the available enabling factors such as digital tools and increased access to networks, in order to accelerate their professional journey. The conference theme says it all: There are no boundaries to what we can accomplish! We need to work optimistically and courageously towards progress and set the example for other leading women to come. Are there any factors that you found particularly helpful in your professional development? I am looking forward to exchanging experiences with you, here on my blog, or my LinkedIn and Twitter accounts.